Weld-On Wet ‘R Dry 725 is an aqua blue, medium bodied, extremely fast setting, high strength PVC solvent cement for all classes and schedules of pipe and fittings with interference fit through 150mm diameter, Schedule 80 through 100mm diameter. Can be used without primer on non-pressure systems if local codes permit. 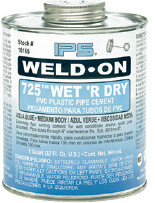 Weld-on Wet ‘R Dry 725 is for use on rigid and flexible PVC pipe and fittings. It is specially formulated for applications where conditions are very wet and/or quick pressurisation is neccessary, use only Wet ‘R Dry P-75 Primer with Wet ‘R Dry Cement. NOTE: IPS Weld-On solvent cements must never be used in a PVC system using or being tested by compressed air or gases. Weld-On Wet ‘R Dry meets ASTM D-2564 and is listed by NSF International for use on potable water, sewer, drain, waste and vent (DWV) systems. It is listed by the International Association of Plumbing & Mechanical Officials (IAPMO) and carries the Uniform Plumbing Code (UPC) seal. This cement is suitable for use with PVC piping systems approved by (SBCC) Southern Building Code Congress and (BOCA) Building Officials Congress of America.